Our goal...to create the most beautiful hand-lettered font foundry in the world. We are artists and designers with an eye for spotting and nurturing talent; we want to provide lettering artists the opportunity to soar. 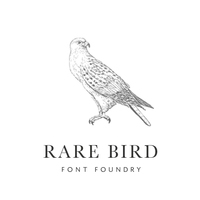 A project years in the making, Rare Bird Font Foundry is dedicated to releasing only the highest quality hand-lettered fonts on the market. Each design starts with pen and ink to paper and is meticulously crafted into a flawless rendition (quirks and all) of an artist’s vision. We craft our fonts for discerning designers, the ones with vision and a deep appreciation of how finding the perfect font means the difference between an ordinary project and an extraordinary one.